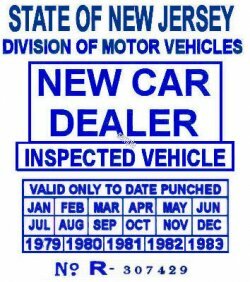 1979 - 1983 NJ NEW CAR DEALER STICKER - $20.00 : Bob Hoyts Classic Inspection Stickers, Add a Final Touch to your Restoration! We know that they existed from 1979 to 1995. They went on the inside drivers side window and were valid usually for one year. These stickers in some dealerships printed in very large black letters the month and date the sticker was expired. For an additional $10.00 we can personalize this sticker with the large black letters that show the expiration. Simply click on the menu that asks for the license plate number and give us the momth/day/year you want printed. .